The Kitani Bandas are self catering units located in Tsavo West National Park the largest game reserve in East Africa which is the largest game reserve in East Africa. 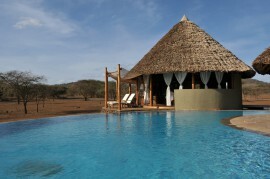 The lodge is 5 kilometers from the Mzima Springs and 2 kilometers from the poachers lookout. Kitani Bandas are now affiliated to the nearby Severin Safari Camp.Being a short distance to Mombasa and Voi, the guests can easily tour these towns for leisure and other many sites and places to visit. 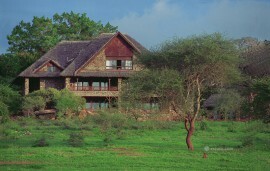 The Kitani lodge offers 8 bandas. The little houses are equipped with kitchenettes with tables and chairs, plates, pots, cutlery, glasses and cups and a herd with a gas and a washing basin. 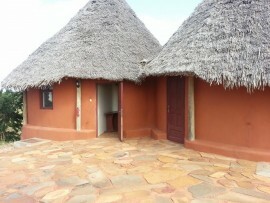 Each has its own bathroom equipped with towels, running cold and warm water, toilet and shower. There are three beds per banda with clean white bed linen and mosquito nets. A baby bed can be provided on prior request. 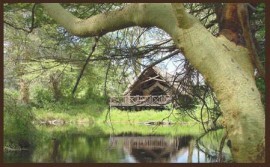 Due to its proximity to Severin Safari camp about 1.5 km away guests can have their meals from their restaurant and refreshments in the Thorn tree bar.